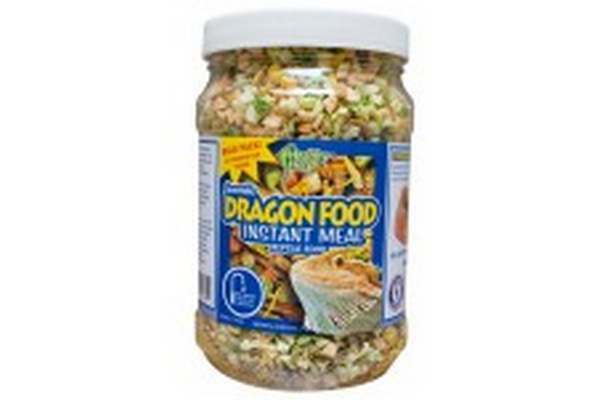 This food has been specifically mixed for Bearded Dragons. When rehydrated Dragon Food returns to its natural state making it irresistible to Bearded Dragons. Contains Freeze Dried Grasshoppers and Meal Worms eliminating the need for live food, Dry Dandelion Greens a natural source of calcium and Calendula Flower Petals to enhance bile production and assist digestion. Feeding Instructions: Remove lid (for bulk use fill cup with food), fill cup halfway with warm water, wait 5-8 minutes. Drain excess water and place in Stepping Stone Feeding Dishª or dump into food dish. Remove any uneaten food after 24 hours and discard. This product has been lightly dusted with calcium, because different reptiles have different needs, please be familiar with your animalÕs requirements and supplement accordingly. This product can be used as a daily diet, in addition to the daily diet or as a treat.